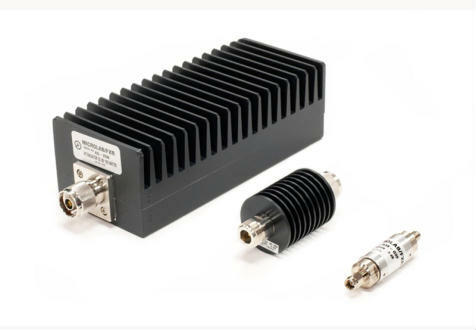 The Microlab coaxial attenuators for wireless applications cover DC to 3 GHz frequency range. Average powers range from 2 W to a full 200 Watts average rating. Powers to 1 kW average and 10 kW peak covering DC to 3 GHz are available to special order. These attenuators are constructed of resistive elements in a conventional series circuit. Higher powers are generally uni-directional, all are exceptionally rugged, and negligibly affected by normal ambient temperature and humidity changes. All 10W units and above are available in alternate packages and connectors such as BNC, TNC and 7-16 mm DIN to order. As far as the low PIM attenuators are concerned, the demands for Low PIM products in wireless systems have generated the need for a new class of product to absorb RF power without reflecting or adding PIM to the signal. Microlab offers 698 – 2700 MHz low PIM attenuators (and terminations) from 10W to 100W in convenient moisture sealed packages (hermetic attenuators), similar to those used in conventional resistive attenuators and loads.